Even though 1Player is presented as the “ultimate tool for all your multimedia needs,” we advise deleting this application. If you are looking for a program that plays DVD, Audio CD, VCD, and other types of files, we recommend installing a more reliable, risk-free program. Do you know what risks are associated with 1Player? This report discusses these risks, as well as the removal of 1Player. Note that if after reading this report you have some questions regarding the removal process, you can always start a discussion in the comment section below. Have you downloaded 1Player from onefloorapp.com/1player.aspx? If you have not downloaded this potentially unwanted program (PUP) from its official website, you must have downloaded it packed with other programs. Some of them might require urgent removal. 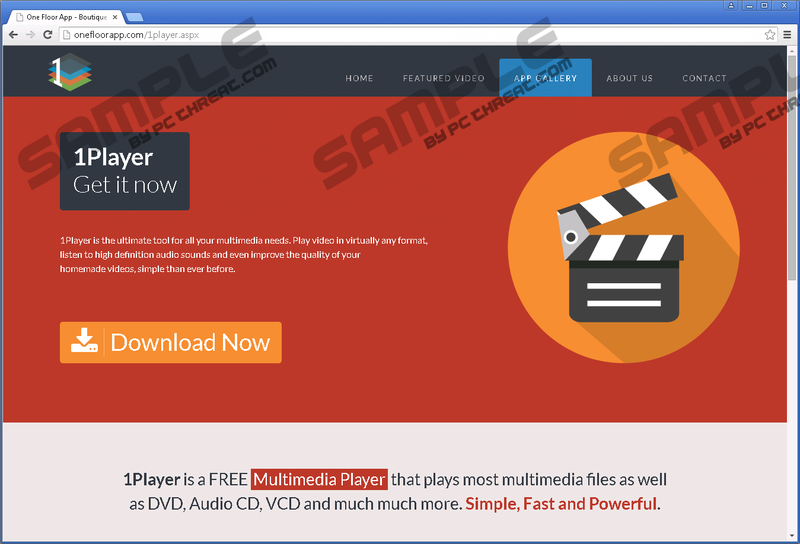 There are many third-party software distributors that could offer you to install 1Player; unfortunately, many of these distributors could trick you into downloading highly malicious programs alongside this PUP. If you do not want to encounter a bunch of unreliable programs that you would need to delete from your operating system, you should not trust third-party installers. All in all, we recommend removing 1Player even if you have downloaded it from its official website. Some malware researchers remove 1Player as an advertisement-supported program due to its ability to show advertisements. These ads will keep showing up on the websites you browse and in the interface of the suspicious media player until you delete 1Player from your operating system. Every single ad shown to you by 1Player needs thorough investigation, and we cannot claim that all of them will be unreliable; however, you can avoid encountering unreliable ads by ignoring all of them. Luckily, it is not difficult to remove the program published by OneFloorApp Ltd. from your PC. 1Player collects information about your virtual activity and uses it to showcase more alluring ads. Keep in mind that not all attractive ads can be trusted. These are the reasons you should remove 1Player from your Windows operating system. You will achieve success in no time if you follow our removal instructions right below this article. Unfortunately, we cannot guarantee that these removal instructions will help you delete 1Player-related infections and other potentially unwanted programs. If you want to try to delete these programs manually, use a malware scanner to scan your PC for leftover files. If the manual removal option does not work for you, go ahead and install an automatic malware removal tool. Click the Start icon on the Taskbar to open the Start menu. Click the Windows icon on the Taskbar to open the Start menu. Access the Metro UI screen, open the Charm bar, and click Search. Using the search tool access the Uninstall a program menu. Quick & tested solution for 1Player removal.